Persimmon Place is a modern ground-up development in Dublin, California. The 153,380 sq. ft. center offers an upscale, convenient and smart shopping destination that showcases a unique collection of the Bay Area’s best anchor stores, retail shops and eateries. This past October, the center hosted its second annual Wine Stroll, where one hundred percent of ticket entries benefited the Alameda County Community Food Bank. 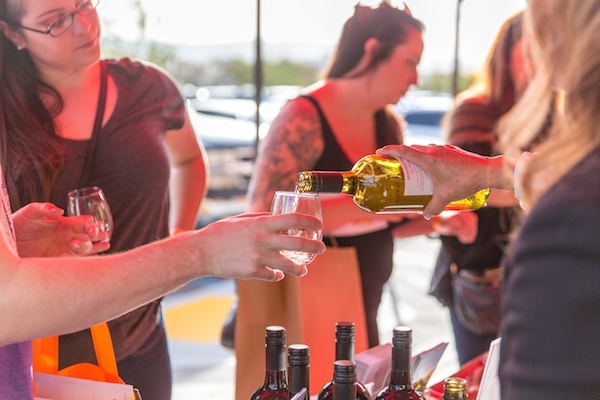 During the event, participating merchants provided pours from local vintners and highlighted in-store specials, demonstrations and contests for guests. Featured vintners included Murrieta's Well, Concannon Vineyard, Fenestra Winery, Nottingham Cellars, McGrail Vineyards & Winery, Steven Kent Winery, Boisset Collection Wine Ambassador / Elizabeth J. Regan, Boisset Collection and Raymond Vineyards. Additionally, guests enjoyed pours from Frank Family Vineyards at Patxi's Dublin, Apothic Wine and Barrymore Wines at Starbucks, San Simeon Wines at Whole Foods Market Contra Costa & Tri-Valley and Irony Wine at Urban Plates. Visitors strolled the center, visiting the various stores and restaurants, while stopping along the way to enjoy wine and craft beer, food samplings and demonstrations. Live entertainment and activities were incorporated throughout. Event ticket included the wine tasting, food samplings and keepsake Persimmon Place logoed wine glass. More than 275 people attended the 2016 Wine Stroll, generating $5,500 which was donated to the Food Bank – equivalent to 12,600 meals for children, adults and seniors in Alameda County. The center opened in 2015 and since has become established as the community’s gathering place. It is a 2016 ICSC U.S. Design and Development Award finalist, an award that honors and recognizes outstanding design and development trends throughout the nation. Award winners will be announced during the 2016 ICSC CenterBuild Conference in Phoenix, Dec 1. Visit Persimmon Place on Facebook for updates.